A view of the pavilion of Gahanga Cricket Stadium. President Paul Kagame officially inaugurated it on October 28, 2017. After two years of waiting, Gahanga International Cricket Stadium, the new home of cricket in Rwanda, will be officially launched on Saturday. The construction works on the state-of-the-art facility, the first of its kind in the region, started in April 2015 after the Rwanda Cricket Stadium Foundation received a lease certificate for a 4.5-hectare plot in Gahanga sectr, Kicukiro district. Saturday being the 'Umuganda Day, the stadium launch will begin with community work at Ntarama in Bugesera district, Eastern Province in the morning before the ceremonies get underway at midday. The grand opening will be attended by among others, the Minister of Sports and Culture Juliane Uwacu, Rwanda Cricket Stadium Foundation (RSCF) Project Director Alby Shale, the (the son) of Christopher Shale, who began working on the idea of building a cricket stadium in Rwanda. The foreign guests include; Michael Paul Vaughan (OBE) a former English cricketer captain, Alan Higgin, the Chief Investment Officer at Coutts & Company, former South African cricketer and current CEO of the International Cricket Council (ICC) David John Richardson, Sarah Ferguson the Duchess of York and British writer, as well as William Russell the Sheriff of the City of London, among others. 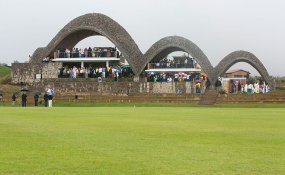 According to the Rwanda Cricket Stadium Foundation general manager, Eric Dusingizimana, the stadium has a height of 124 meters high, and the width of 137 meters, with a modern grass pitch of 'Bermuda Grass', which is commonly used in modern cricket stadiums. "The completed part of the stadium is built on a two-hectare area, and we are remaining with 2.5 hectares of land which will be used in the future," Dusingizimana told a press conference on Thursday. The national team captain noted that, "The money used in the construction of the stadium was raised by the fans of Cricket worldwide, and we are happy that Rwanda has a stadium that will host international matches." Meanwhile, the final of the ongoing 'Cricket Builds Hope Tournament' between Uganda Select XI and Christopher Shale XI will be played on Sunday afternoon at Gahanga Stadium. Uganda defeated Rwanda XI by 43 runs in the semi-finals played on Thursday at Gahanga Stadium. Rwanda won the toss and opted to field first, with Uganda managing 139 runs in the allotted 20 overs for a loss of 9 wickets - Rogers Olipa top scored for the Uganda select side with 22 runs and was supported by Brian Masaba (19 runs). In reply, Rwanda was bowled out for 92 runs in 19 overs. Rwanda XI reached the semi-finals after defeating Kenya by 33 runs as well as UK side Coutts by 70 runs. The tournament, which is the curtain raiser for the official launch of the stadium, attracted eight teams including five invitational teams from the UK. The main celebrity cricket game between cricket legends 'Brian Lara XI' and 'Michael Vaughan XI' is scheduled is set to be played on Saturday as part of the ceremonies to launch Gahanga International Cricket Stadium.